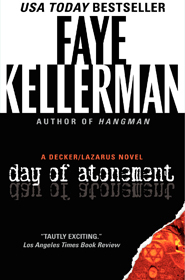 DAY OF ATONEMENT is the fourth novel featuring my dynamic duo. Decker and Rina are now a married couple in New York for the high holy days. While Rosh Hashanah is the holiday of introspection, Decker’s personal thoughts are cut short by the kidnapping of a young yeshiva boy. The investigation leads Decker and Rina on a terrifying, cross-country odyssey.